Dr. Victor Burrell, an alumni and adjunct faculty member of the College of Charleston passed away on December 20, 2009. He researched and published several scientific papers and histories of important South Carolina fisheries. Dr. Burrell played an integral part in the organization of the South Carolina Fisheries Workers Association and served on the founding board of the South Carolina Aquarium. In 2007, he was chosen as the Fishery Conservationist of the Year by the South Carolina chapter of the American Fisheries Society. A memorial by Dave Bushek was published in the quarterly newsletter of the National Shellfish Association. Creagrutus yanatili, a new species of Creagrutus tetra was discovered in southeastern Peru. Ichthyologists Dr. Antony Harold and Dr. Norma Salcedo successfully published their discovery of this new species in the journal ofIchthyological Exploration of Freshwaters. Tetra fish species are described as small freshwater fishes belonging to the family Characidae. Due to their hardiness and bright colors, tetra fishes are quite popular with aquarists. Creagrutus yanatili differs from other Creagrutusspecies in South America due to its well developed papillae (small projections) that extend behind the head and its nearly black pigmentation that covers much of the fins and body of the fish. To view pictures of the expedition click here. Harold, AS and NJ Salcedo (2009) Creagrutus yanatili, a new species from the Río Urubamba drainage, southeastern Peru (Teleostei: Characidae). Ichthyological Exploration of Freshwaters 20, pp. 377–383. A NIST Techbeat article titled Marine Lab Hunts Subtle Clues to Environmental Threats to Blue Crabs spotlights a collaborative research effort between National Institute of Standards and Technology (NIST) and the College of Charleston (CofC). The research group is using Nuclear Magnetic Resonance (NMR) spectroscopy to evaluate oxidative stress in the economically, ecologically and recreationally important species. The research conducted at the Hollings Marine Laboratory is discussed in detail in their recent Metabolomics publication. The 2010 Graduate Student Research Poster Session was held on Thursday, January 28. Congratulations to graduate students Nathaniel Johnson (GPMB) and Katherine Luciano (MES) for their recent poster awards. The fourth annual poster session was a huge success, featuring the research of 35 graduate students. Please visit the College of Charleston Graduate School blog and facebook page for details and pictures of the event. The Grice Lab was well represented at the annual meeting of the Society of Integrative and Comparative Biology in Seattle, Washington, January 3-7, 2010. Members of the Burnett, Podolsky and McElroy labs were among the more than 1700 attendees at the international scientific conference. The program included research presentations by undergraduates, graduate students and faculty, as well plenary talks by leading scientists, including Dr. Bruce Alberts, editor of Science magazine. Representing the Grice laboratory, graduate students Daniel Fernandes, Kolo Rathburn, Nat Johnson and Kris Stover gave oral presentationsof their research, as did Drs. Bob Podolsky, Eric McElroy and Kristin Hardy. They also took some time before and after the meeting to enjoy the sites of Seattle, including the Pike Place Market, Pioneer Square, and even nearby Forks. On January 16th, a group of 12 students from James Simmons Elementary School visited Fort Johnson and participated in the Grice Marine Lab’s CORAL (Community Outreach Research And Learning) program. It was a morning full of marine science education and fun. The students started at the bottom of the marine food chain by examining various plankton and invertebrates through microscopes. Moving up the chain, they watched as the fish in the display aquarium were fed grass shrimp. At the top of the food chain, they viewed a scorpion fish and a hammerhead shark from the Grice Collection. Our collection has about 350,000 specimens of fish and invertebrates used for teaching and research. The Grice tour finished with a touch tank experience in our wet lab. 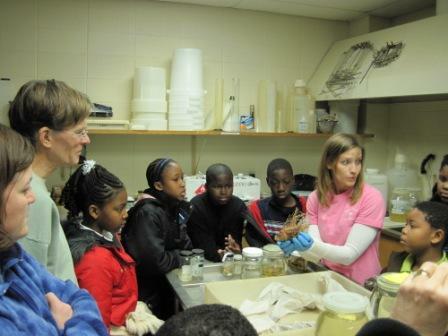 In a collaborative outreach effort with the SC Department of Natural Resources, the students visited the Marine Resource Resources Institute (MRRI) with Dave Wyanski. In his tour of the MRRI lab, he discussed his work with the Marine Resources Monitoring, Assessment, and Prediction (MARMAP) Program. This project works with NOAA to conduct biological surveys and assessments used to evaluate the size, abundance and life history of reef fishes. The program has conducted ichthyoplankton surveys and trawl-based bottofish surveys in the past. On Thursday, January 21st, CORAL also participated in the first annual Science Night on location at the James Simmons school. Our touch tank gives students the opportunity to interact directly with marine organisms. It creates a platform for education about marine life and provides discussion opportunities about the ocean and how it affects human health.